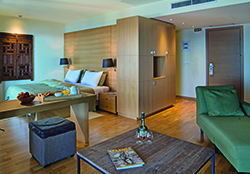 Domotel Anemolia, member of Domotel boutique and lifestyle hotels, is the ultimate year-round mountain resort for relaxation and outdoor activities, on the outskirts of the cosmopolitan Arachova village. 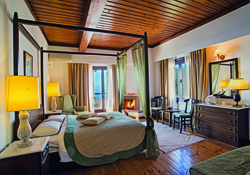 After its renovation, it has been converted into a four-star hotel combining rustic charm with modern facilities and tailor-made services. 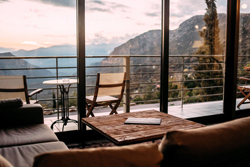 Domotel Anemolia is idyllically located on the outskirts of the cosmopolitan Arachova village offering breathtaking views to the Delphi Valley and the Parnassus mountain range. 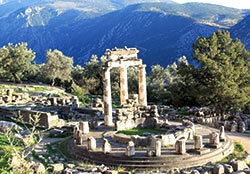 It is the perfect starting point to explore the nearby Delphi archaeological site, the picturesque Galaxidi fishing village, the Byzantine monastery of Osios Loukas and mount Parnassus, which is top destina¬tion for skiing and snowboard during the winter season as well as for trekking, hiking, and mountain biking all year round. 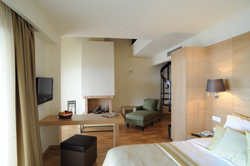 Domotel Anemolia is the ideal gateway for those seeking high level accommodation in a quiet location within walking distance from the cosmopolitan Arachova, often identified as the winter Mykonos. 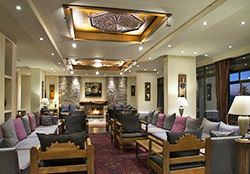 Tradition meshes with modern design in perfect harmony creating a cozy feeling. 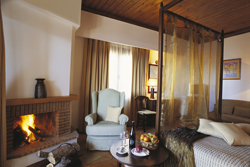 The hotel offers 101 comfortable rooms and suites (60 Standard double rooms of 25m², 16 Executive rooms of 35m², 4 Family Chalet rooms of 38-48m², 11 Mini Suites of 35m², 3 Executive suites of 48-75m² and 7 Family Executive Suites of 48- 75m²) spread in 3 wings. 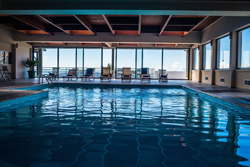 Rooms are flooded by natural light, most of them offer a balcony or veranda enjoying amazing views and they are equipped with modern amenities for a comfortable and unforgettable stay. Well behaved small to medium sized dogs are welcome at Domotel Anemolia. The hotel offers a daily breakfast buffet enriched with local delicacies, as well as a menu of Mediterranean cuisine based on fresh products and traditional local flavors, ideal for lunch or dinner. 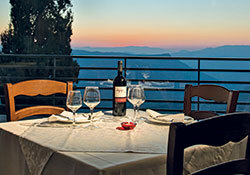 Drinks and snacks paired with a glass of wine from the rich collection of the hotel's wine list can also be enjoyed by the fireplace at the rustic style Bar Restaurant that extends to a veranda with stunning views to Delphi valley and Parnassus mountain, the perfect spot for relaxation. 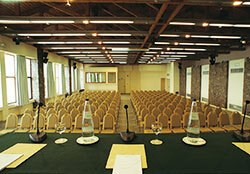 Domotel Anemolia offers naturally lighted, multi-functional halls, ideal for corporate events. 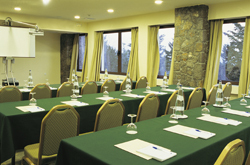 The specially designed spaces equipped with modern audio-visual equipment as well as the hotel's professional staff, ensure the success of professional meetings, scientific conferences, training seminars and team building events. Parnassus Ski Resort: 26 km.